Blood vessels are extremely dynamic: depending on the external conditions, they can adapt their permeability for nutrients, their contractility, and even their shape. Unlike cardiac muscle cells, for example, the smooth muscle cells in blood vessels demonstrate a high degree of plasticity, so they can specialise or multiply as required, even repairing damage to the vessel wall. This vascular remodelling is evidently precisely regulated. Disruptions are extremely significant in conditions such as atherosclerosis or high blood pressure. At the Max Planck Institute for Heart and Lung Research in Bad Nauheim, scientists conducting research on genetically modified mice have discovered how external signals regulate vascular remodelling at cell level. This has created an entirely new understanding of regulation, which could pave the way for new approaches in the prevention and treatment of atherosclerosis and other vascular diseases. The walls of blood vessels consist of smooth muscle cells, elastic fibres, and endothelial cells, which line the interior surface of the vessel. The vessels change their permeability and contractility as required. If a blood vessel is damaged, existing smooth muscle cells can give rise to new specialised muscle cells to repair it. However, in the case of a vascular problem, this necessary and useful cell plasticity can have negative consequences. For example, if a coronary blood vessel is opened up with dilatation and stents via a catheter, muscle cell growth may cause it to narrow once again. In the common condition atherosclerosis or vascular calcification, too, remodelling processes lead to formation of the dreaded plaque. All these processes are regulated by hormones or neurotransmitters, some of which are released by cells and nerves in the vessel wall. Most of these vasoactive messengers work by binding to receptors, which in turn, once activated, bind to what are known as G proteins. These are situated on the inside of the cell membrane and relay the signal from there into the cell interior. “There are two different families of G proteins which play a crucial role in vascular remodelling. They are called Gq/G11 and G12/G13 after their protein components,” explains Max Planck scientist Stefan Offermanns, who has been researching these proteins and their molecular signalling pathways for several years now. In the latest study on genetically modified mice, the team was able to demonstrate for the first time how, in a living animal, these two signalling pathways are regulated by messengers. “Contrary to expectations, the two G protein-mediated signalling pathways antagonistically regulate the plasticity of smooth muscle cells,” says Offermanns, summarising the findings. This is surprising in that these signalling pathways act together in other contexts: stimuli that promote vessel contraction and thus increase blood pressure activate both signalling pathways in parallel. In order to investigate the signalling pathways and their regulation, Till Althoff, who headed the study, examined mice whose genes for the various G proteins he had specifically deactivated. 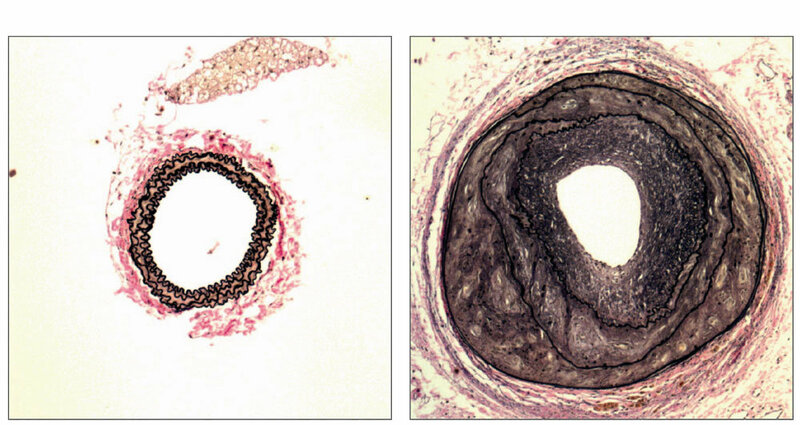 Thus the researcher was able to show, for example, that in a mouse suffering from atherosclerosis and missing G12/G13in the smooth muscle cells, these cells begin to grow excessively – the result was a considerably thickened vessel wall. By contrast, animals lacking a Gq/G11 protein were protected against this thickening of the cell wall. “We see here clearly that in vascular remodelling the two signalling pathways work as antagonists,” Offermanns explains. Which is only sensible, as it is the only way a system can balance cell growth and regression. In further tests, the scientists also demonstrated the steps required for the two pathways to achieve their objective and stimulate the genes in the cell interior responsible for generating specialised cells or for cell growth. “Our results really do reveal a completely new picture of the regulation of vascular remodelling, also in pathological processes,” says Offermanns. The researchers are therefore hopeful that new pharmacological approaches can be developed. Offermanns can well imagine, for example, that drugs could be used to modulate plasticity in cases of vascular diseases like atherosclerosis or after cardiological interventions. Now that the target structures in both signalling pathways have been identified, new possibilities are opening up. For instance, the pathway that promotes growth could be blocked and the stabilising pathway activated in order to slow down the remodelling process. “In animal models we are already investigating new therapeutic approaches to preventing atherosclerosis and suppressing cell growth in damaged vessels,” reports Offermanns.